SafetyMax Emergency Equipment Maintenance Services are designed for companies who want to insure their emergency equipment and supplies are properly maintained and ready in case of an emergency. Save Money, Save Time. Be Prepared. 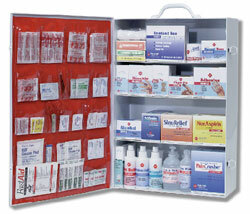 Never worry about running out of needed first aid supplies. Our First Aid Kit Maintenance / Restocking Service is the "industry standard" and is designed for companies who want to stay prepared in the event of a medical emergency -- without spending unnecessary time or resources. Simple and easy to start service - schedule a service visit at your convenience. With SafetyMax First Aid Kit Maintenance Service, you will always be prepared should a medical emergency occur, without any hassle on your part. Our emergency preparedness expertise and turn-key system assure that you always have the proper first aid supplies on hand to meet your company's needs. SafetyMax is the leading provider of emergency preparedness consulting, training and supplies. We offer businesses customized, turn-key emergency preparedness solutions that reduce liability, are easy to implement and assure the safety of employees in the event of an emergency.